A file with the .VSD file extension is a Visio Drawing file created by Visio, Microsoft's professional graphics application. VSD files are binary files that might hold text, images, CAD drawings, charts, annotation, objects and more. Microsoft Visio 2013 (and newer) default to storing Visio Drawing files with the .VSDX file extension, which are based on XML and compressed with ZIP. Visio files are used to make everything from software and network diagrams to flowcharts and organizational charts. VSD is also an acronym for some other things that have nothing to do with computer file formats, like variable speed drive, Visual Studio debugger, vertical situation display and virtual shared disk. It's also the name of the disc-based analog video format that stands for Video Single Disc. Microsoft Visio is the primary program used to create, open and edit VSD files. However, you can open VSD files without Visio too, with programs like CorelDRAW, iGrafx FlowCharter or ConceptDraw PRO. Some other VSD openers that work without having Visio installed, and that are 100% free, include LibreOffice and Microsoft Visio 2013 Viewer. The former is a free office suite similar to MS Office (which is what Visio is a part of) and the latter is a free tool from Microsoft that once installed, will open VSD files in Internet Explorer. LibreOffice and ConceptDraw PRO can open VSD files on macOS as well as Windows. However, Mac users can also use VSD Viewer. If you need a VSD opener for Linux, installing LibreOffice is your best option. Visio Viewer iOS is an app for iPad and iPhone that can open VSD files. VSDX files are used in MS Office 2013 and newer, so you need the Microsoft Visio Compatibility Pack if you want to use the VSDX file in an older version of the software. VSDX files are structured differently than VSD files, which means you can extract some of the contents out without even needing any of these programs. Your best bet is with a free file extractor like 7-Zip. Zamzar is a free document converter that lets you convert a VSD file online to PDF, BMP, GIF, JPG, PNG and TIF/TIFF. You can use Visio's File > Save As menu option to convert a VSD file to VSDX and other Visio file formats like VSSX, VSS, VSTX, VST, VSDM, VSTM and VDW. 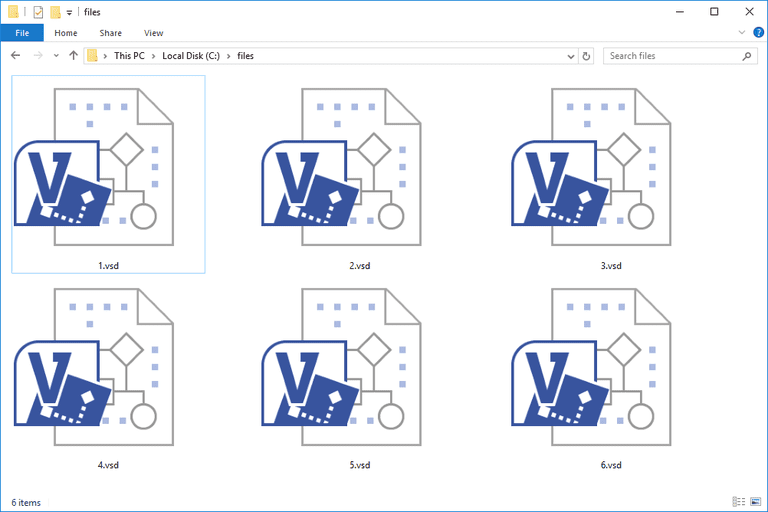 Visio can also convert the VSD file to SVG, DWG, DXF, HTML, PDF, and a number of image file formats, making sharing really easy. The other programs mentioned above can probably save VSD files to other formats as well, probably through a Save as or Export menu. The VSD format uses lossless compression to compress the contents of the file. A similar format called Visio Drawing XML (which uses the .VDX file extension) does not. This is why VDX files are often three to five times larger in file size than VSDs. Even though Visio 2013+ does not default to storing new documents in the VSD format, these versions still fully support the format so that you can open, edit and save to it if you want to. If the information above isn't helping you open or convert your file, you might not be dealing with a VSD file at all. Check that you're reading the file extension correctly; it should read ".VSD" at the end of the name. If it doesn't, you might instead have a file that just shares some of the same letters as VSD files. For example, the PSD file format looks almost like VSD but it's used with Adobe Photoshop, not Visio. ESD files are similar but might be used with either the Microsoft operating system or the Expert Scan software. Another one that's a little confusing is the VST file extension. This kind of VST file might be a Visio Drawing Template file but it might instead be a VST Audio Plugin. If it's the former then it, of course, can open with Visio, but if it's a plugin file, it has to be opened with a program that can accept that kind of VST file, which isn't Visio. The VHD and VHDX file extensions are similar too but those are used for virtual hard drives.